A “slipped disc” is not a medical term. Discs cannot slip, but they can ewedge, bulge, protrude and herniate which will lead to pain ranging from mild to severe. Disc problems can be addressed naturally and without drugs through chiropractic intervention. The “disc” in your spine is actually a piece of cartilage which rests between the bones in your spine. In the event that the soft portion of this cartilage ruptures and leaks, you’ll experience a rather severe amount of pain. The cartilage is there to allow nerves to exit the spine, and a rupture can interrupt their ability to function. 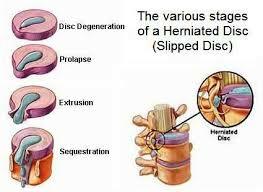 Herniation – The disc causes the nerve openings in the spine to constrict. Protrusion – In the case of protrusion, the disc will bulge and place pressure on nerves. Prolapse – If the disc ruptures or prolapses, you’ll quickly discover that movement can be very painful. How can chiropractic treatments help my disc issues? Are disc issues part of the aging process and thus normal? Disc problems like the ones being discussed here are not normal and shouldn’t happen unless the patient has neglected caring for their spine properly over a long period of time. There are many elderly people with excellent spinal health. I don’t understand why a disc is involved, especially since I haven’t done anything. This is a common question we hear from our patients. A specific incident doesn’t necessarily have to lead to disc problems: it can simply be the accrued result of a lifetime of physical stress.